Going Winter camping?? Ever, wonder which tent to take?? Do you have snow?? Is it cold enough?? Leave the tent in the truck. Grab a shovel or two and get to it!! Pile the snow into a big pile. Let it settle and bond. Hollow it out.....viola, a quinzee snow shelter. I am sure there are a hundred blogs or websites that have detailed instructions for building snow shelters. I have posted a few pic's of a recent trip. Enjoy. Sometimes, creating a second access point can speed up construction time. Of course, you will want to have a plan for how to fill that void before you have to live in your shelter. When the snow is not too deep a large area must be cleared to create a pile of snow large enough to live in. Lakes make great building locations, provided the ice is thick enough. 12" seemed like a good thickness. The area around this shelter was cleared for about 20' in all directions. The toboggan in the picture is my Pelican 45. Points to consider.....the interior wants to be hollowed out, leaving the walls and roof neither too thick nor too thin. We discovered on this trip that some shelters that had too flat of a roof, began to sag. That shelter was found to be too unstable to sleep in over night. Ideally, you want to have an arched interior shape to provide space and strength. Best of all, when getting out for a Winter Camp is the incredible scenery. Wouldn't miss that for anything. Until next time.....get out camping!!! 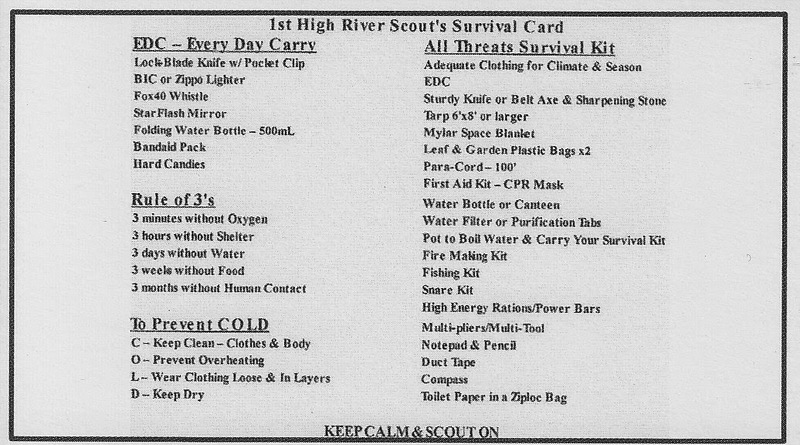 Please find below some of the ideas we have had in our area regarding building Scout Survival Kits. (You may use the ideas, just please give credit due to your source. Thanks.) 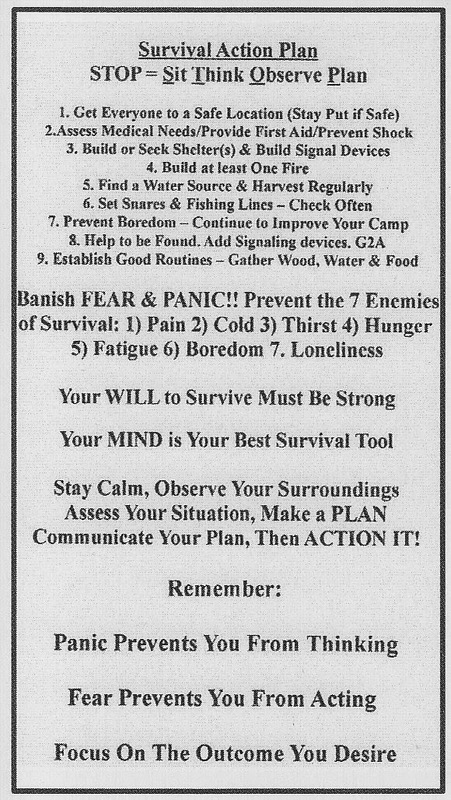 Remember to emphasize that the mind/brain is the most important part of any survival kit. Antihistamines, Anti-diarrhea, Antacids, Antiseptic Towelettes, Splint, Stretcher, Mirror. Shelter – Super Shelter will require: a tarp, space blanket, 2x large clear leaf & garden bags and paracord. footwear, Sleeping Pad, Para-cord or rope. axe is well suited for chopping chores around camp, but it is too short and too light for serious lumberjacking. sharpening stone or small file to keep these tools sharp. Dull edges are deadly. 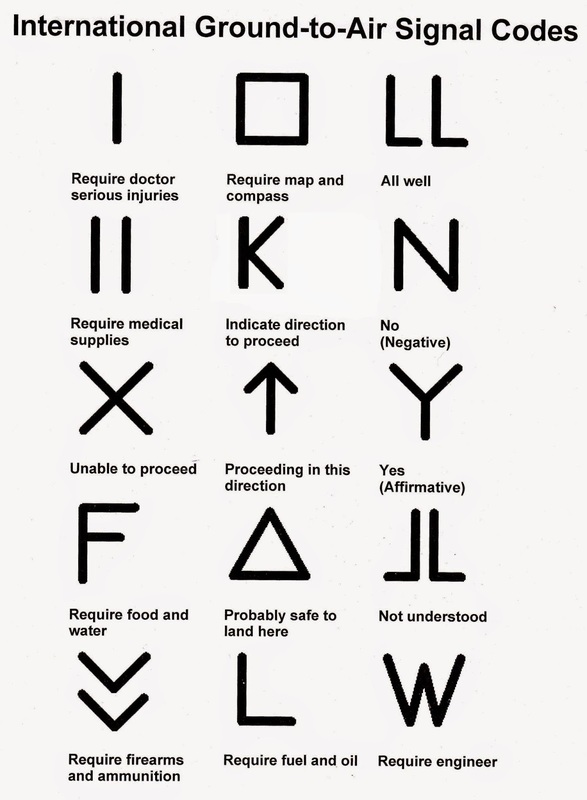 Signals – To speed up rescue time, you need to get found ASAP. Have at least 2 signal methods. LED headlamp that can be set on flash mode – this will draw attention and use less battery power. the signal after message has been received by an aircraft. makes for souvenirs for the rescuers. Fatigue, Boredom & Loneliness. And you will always come home. items can simply be left in the pockets. ● Lock-blade knife. Preferably, with a pocket clip. Like the Gerber Para-frame. ● BIC lighter or mini-lighter, even a Zippo would work for EDC. ● Whistle. Like the Fox40 on a lanyard or a loop of para-cord. ● Mirror. StarFlash with a lanyard or loop of para-cord in a fleece pouch. piece of cardboard, but will fit a cargo pocket. ● Bandaid pack. For treating daily oops'. ● Hard candies, for energy. you pot or boiling vessel. Whistle & Mirror. Fox40 & StarFlash. Flashlight or headlamp and spare batteries. Crank flashlight would also work. survival kit. You may need to improvise some items for now and replace them when you can. Remember to review the items in your survival kit at least once a year. Replace items that may expire, like batteries or food. Three items today, recently purchased from online sources. 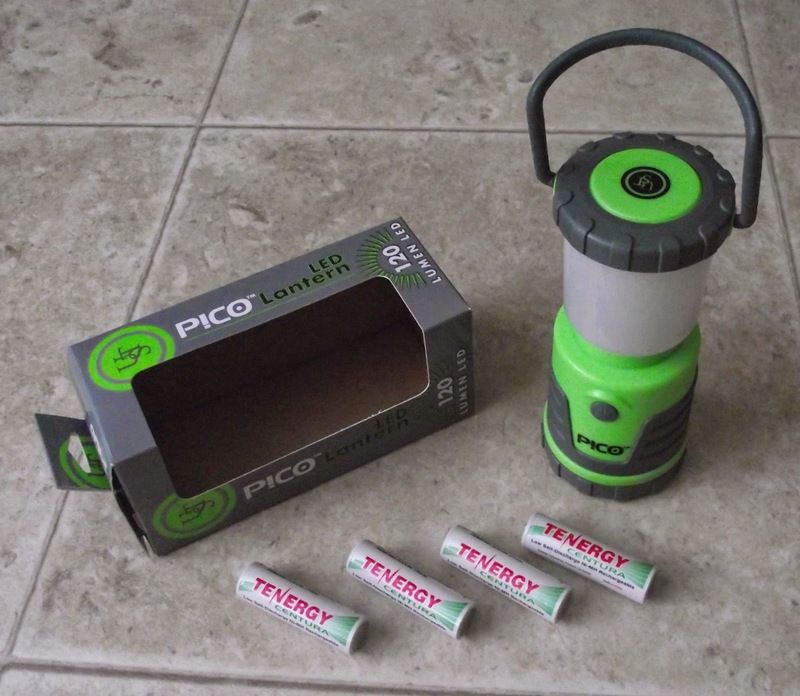 First up is the Pico LED Lantern from UST (Ultimate Survival Technology). This little lighthouse is powered by 4x "AA" batteries, I recommend rechargeables, but that is just my suggestion. On the high setting this unit produces 120 lumens of light and will run for 22 hours. On low, you get a 15 lumen glow that lasts for 91 hours. And if needed, the SOS strobe will continue to send your message for 120 hours, before your batteries require a recharge. For more details see my posting here: http://thegoodplanblog.blogspot.ca/2015/01/a-good-area-light.html on my The GOOD Plan Blog. A most recent arrival is this $4 LED flashlight. 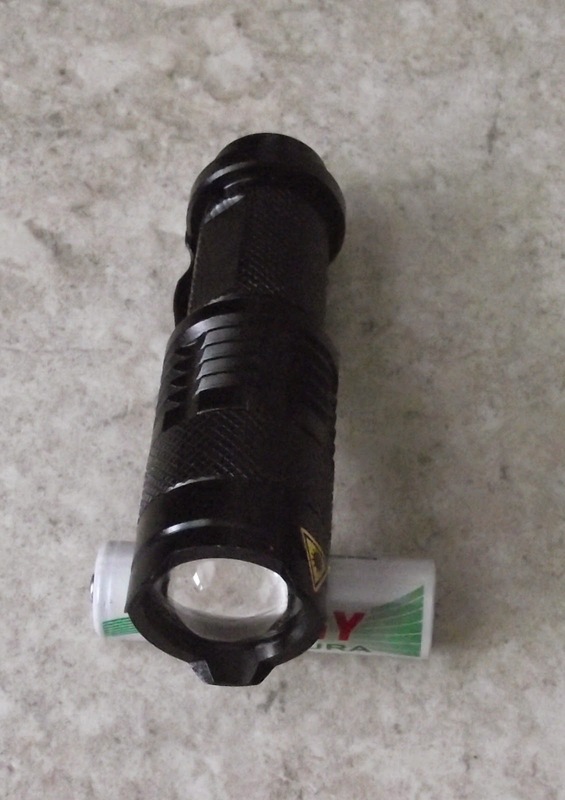 This was ordered off of amazon.ca ( http://www.amazon.ca/300lm-Flashlight-Torch-Adjustable-Focus/dp/B006E0QAFY/ref=aag_m_pw_dp?ie=UTF8&m=AMTS6SG366MYX ) The vendor was hotsalecanada via the Amazon Marketplace. This very compact flashlight runs on a single "AA" battery. It is quite bright. Manufacture says 300 lumens on high. It has a low setting and a defence strobe setting. It is an all metal design (aluminum??) with the switch on the tail-cap. A pocket clip. And a large glass lens. For less than $4 per unit, you can afford to stock-up and ensure you have light in every BOB or backpack. I will add survival kit items in the future, using this same catagory. I may even post a short paper on survival kit considerations.